The start time for the race was advertised as 5:00 pm, so we had to leave work early to get there on time. While we were preparing the boat, the wind seemed to be quite a lot in the NE instead of Metservice forecast of SE, and it was up a bit, so we decided to sail with our small headsail – this nearly made us late for the start. 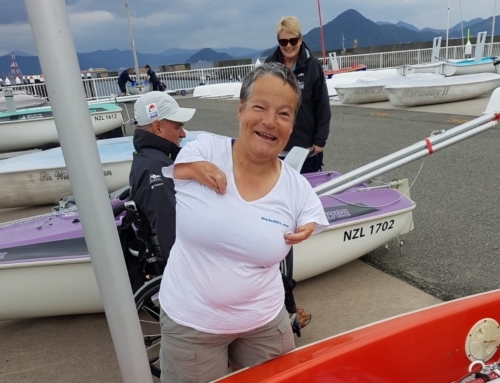 Jane Grant from Alberta Rose saw us changing our headsail in the marina, and advised us that the wind would be going down in a couple of hours – I wonder who told her that? Surely not James, trying to sugar-coat the truth about the increasing wind forecast? Anyway, it was a rush to make it to the start on time, and there were a few boats that looked like being late, but fortunately there was time for everyone to make it. Thanks to Nathan Bonney for doing the start, good job there that man. There were 11 boats starting the race, and it was good to see a new addition to the fleet in the Davidson 28 Petty Theft sailed by Steve Dunlop and his brother, and it was also good to have Graeme Collie out on Moon Mist with his nephew Nick for crew. Wind was NE at about 15 knots for the start. Romany, Mr Roosevelt and Ocean Rhythm started well at the windward end, Starlight was away quickly at the pin, and most of the fleet were not far behind these. Tomodachi was all set to go when they had the misfortune to tear the #1 headsail, so they were a bit late sorting out that mess and getting their inner headsail working. The Moody is a big, heavy yacht, and really needs its big sail to perform well, so they were badly slowed by this little problem. Crocus was quite late to the start, perhaps 2 minutes or more behind the rest. The wind was far enough NE that the race started so it was almost a beat past North Head and up the Channel towards Tiri. The yachts settled into their paces quite quickly, with the long Davidson Yachts quickly taking the lead and moving away. Starlight Express was going very well indeed, as was Mr Roosevelt and Outlaw. These were followed by Romany, Result, Ocean Rhythm, Moon Mist, Albert Rose, Petty Theft, Tomodachi and Crocus. The race was fairly hard on the wind all the way to Tiri Channel, and most boats made it there in the single leg easily enough, except Crocus who had to do a long tack across to clear through. The wind during this leg was quite pleasant, it was about 15-18 knots for the most part, but quite full of holes, so the crews were kept on their toes to maintain best boat-speed. After 15 miles of racing to Tiri, Starlight Express was a long way in the lead, then came Mr Roosevelt, with a significant gap back to Outlaw. Some distance back from there again were Romany, with Result not far behind, then Alberta Rose locked in a tight tussle with the Davidson 28 Petty Theft. Then came Ocean Rhythm, Moon Mist, Tomodachi and Crocus. Ocean Rhythm was loving these conditions and sailing very well for her handicap. Once the fleet cleared Tiri Channel, we were able to bear away slightly, and speeds increased, as did the breeze. We were happy to have our small headsail on, and most yachts managed the reach quite nicely, though some were running a little over-powered through this section. Alberta Rose took in a reef, and the loss of speed while they did this allowed Petty Theft to steal a decisive lead in that particular contest. Ocean Rhythm had a very nice leg down here, and Mac Nell said that this was the first time he can remember Ocean Rhythm sailing at speeds consistently over 7 knots, doing 7.1, 7.3 etc along the ride to the finish at Martello Rock. Crocus would have been a great deal happier to finally be able to crack the sheets and show some real speed, and Craig and Sarah Morgan (Sarah was crew for Crocus on this race) would have thoroughly enjoyed that ride. As can be seen from the results, Starlight Express finished in just under 3 hours, not bad for a 25.5 mile race with 15 miles of windward work and only 10 of cracked reaching. Mr Roosevelt had an excellent race from start to finish, and was second over the line, with Outlaw being the third finisher. There was a little confusion about the finish amongst some of the yachts, but everyone safely passed Martello Rock, and most had a pleasant sail and a fast race. Tomodachi was unable to show her true pace for this race, being severely slowed by a shortage of canvas. Crocus suffered a little because the long leg to Tiri was just a bit to tight for the yacht, otherwise Crocus may have showed a bit better in the results. We had the prize-giving BBQ at Mansion House bay on Sunday night, and this was quite a good venue – all the kids had a lot of fun together, and the adults were able to catch up on Christmas Cruise news and anything else in the world. We were also able to try a bit of Matt’s new discovery – Sailor Jerry’s spiced rum. Very nice indeed, but inclined to kick back the next morning. It was good to catch up here with Lynne And Fendall Halliburton, and also John Leech and his girls – we were a merry company, and there were a few fairly ugly Hawaiian shirts on display. When prize-giving came, Graeme Collie from Moon Mist was voted owner of the worst shirt – a particularly grotesque and rather gay-looking flowery object – mostly red, set off fetchingly by a pair of Aussie-type green and gold stubbies. Ocean Rhythm was winner on Handicap, with Starlight Express second, and Result third, Petty Theft 4th, Alberta Rose 5th, and Mr Roosevelt 6th. A word to the wise. If you believe in re-incarnation, and want to come back as a cat, don’t get owned by Matt and Cath Woodley – you are likely to end up being incarcerated in the wall space behind re-plastered and tiled bathroom walls! That was the fate of Bailey, who took to the dark places while the renovation work was still in progress, and presumably went to sleep there and did not notice the closure of his entrance way. It took Matt a while to identify where the meouw was coming from, and they had to rip out the new tiles and Gib to release the moggie from his prison. Bailey seemed completely unfazed by this experience so NO ANIMALS WERE HARMED IN THE TELLING OF THIS STORY. Please check the results for mistakes (including the updated series results), and check your handicap is OK. Thanks for another great race report Justin. The RESULT crew had a fantastic weekend with you all – and it will be our last as we head to Europe on the 5th and it looks like we’ve at last sold Result (fingers crossed!). We will miss you all. Jonathan, Kerry & Em.